Single day and 3-day passes for the fourth annual Red Wing Roots Music Festival are available online or at the gate, until they have sold out. The event is held from July 8-10 at Natural Chimneys Park in Mount Solon. The Steel Wheels host the festival and perform several times during the weekend. 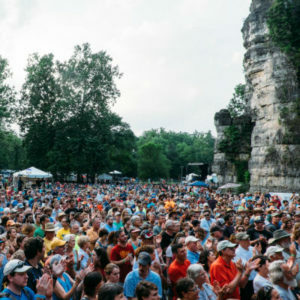 This year they welcome the following headliners: Dawes, Shovels and Rope, The Lone Bellow, Aoife O’Donovan, Steep Canyon Rangers, Drew Holcomb & The Neighbors and many more. To see the full lineup visitredwingroots.com/2016-line-up. Held in the heart of the beautiful Shenandoah Valley, the family-friendly festival will feature more than 40 bands on four stages, over three days of music, surrounded by the great outdoors. Incredible camping, an impressive list of kids activities, bike rides organized and led by the Shenandoah Valley Bike Coalition, fun runs organized by VA Momentum, and a group of food vendors that set a high bar for delicious, unique food set this festival apart from many others. The festival is environmentally aware with attendees encouraged to use their own reusable beverage containers or souvenir steel cups which can be purchased on site. Drinking water is available for free and craft beer, wine, and hard cider are sold in the South Street Beer Garden.